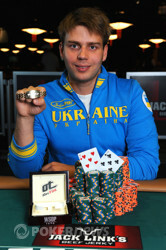 After three days of action Oleksii Kovalchuk won the gold bracelet in the $2,500 Six Handed No Limit Hold’em event. He bested a field of 1,378 players and takes home $689,739 after defeating Ionel Anton heads up. At the start of heads up play the two exchanged the chip lead several times. They were fast and loose with their action until Kovalchuk opened up a chiplead that Anton couldn’t overcome. The final hand Kovalchuk had pocket sevens against a weak ace that Kovalchuk turned into a full house. Day 3 began with 22 players returning to action. Players falling short of the final table were Will Failla, Antony Lellouche and Sam Grafton. Chris Moorman exited in 3rd place after Kovalchuk’s straight draw got there on the river. Dan O’Brien was knocked out in 4th place after he paired his king on the flop but Kovalchuk made a flush on the turn. Mazin Khoury was eliminated in 5th place when he ran his into Anton’s pocket aces. Anthony Ruberto was the first victim of the final table. He took a huge bad beat that crippled his stack and shook the Amazon Room from the crowd reaction. He was in a pot with Kovalchuk and all in on the turn. Ruberto had a set of jacks and Kovalchuk had a set of fours, and then spiked the one-outer on the river making quad fours. Ruberto was eliminated shortly after. 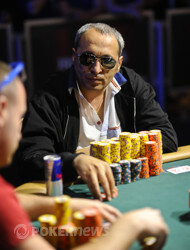 Be sure to follow all of the WSOP action live on PokerNews.com. Oleksii Kovalchuk raised it up to 150,000 on the button and Ionel Anton moved all in for about 1,500,000. Kovalchuk insta-called and flipped over . Anton showed and we waited as the camera crew came in to watch the board be dealt. The flop came down to give Kovalchuk a set of sevens but it also gave Ionel an inside straight draw. The turn came and the river came and Kovalchuk gave a fist pump as he took down the bracelet. 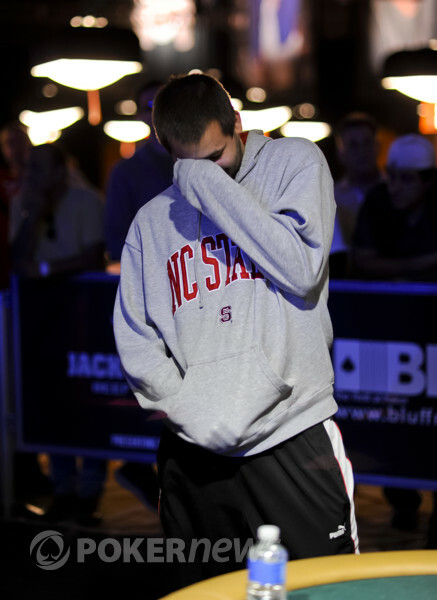 Anton earned $428,140 for second place and played well in a long and grueling heads up match. Ionel Anton raised to 100,000 on the button and Oleksii Kovalchuk called. The flop came , Kovalchuk checked, Anton bet 150,000 and Kovalchuk called. The turn was the , Kovalchuk checked, Anton bet 150,000 again but this time Kovalchuk check-raised to 500,000. Anton called. Oleksii Kovalchuk raised it up to 150,000 on the button preflop, Ionel Anton then re-raised it to 400,000 and Kovalchuk called. The flop came down and both players checked. The turn was the and Anton bet out 250,000. Kovalchuk just called. The river was the , Anton checked, and Kovalchuk bet 775,000. Anton took some time then called and Kovalchuk showed for a full house. 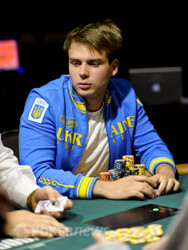 Kovalchuk took back a two to one chip lead after the hand. Ionel Anton made it 450,000 on the button and Kovalchuk called. The flop came and Kovalchuk checked. Anton pushed out 550,000 and Kovalchuk moved all in for 2.22 million more. Anton leaned way back in his chair, took off his sunglasses and rubbed his eyes. He thought long and hard for a short while and eventually folded, bringing Kovalchuk back to almost even with Anton. Mazin Khoury reacts to being eliminated. Chris Moorman stacks chips after winning a big pot.